In the study, the researchers mimicked environmental factors that could activate the immune system—such as an infection or an autoimmune disorder—by injecting a pregnant mouse with a very low dose of lipopolysaccharide, a toxin found in E. coli bacteria. The researchers discovered the toxin caused an excessive production of neural stem cells and enlarged the offspring's' brains. 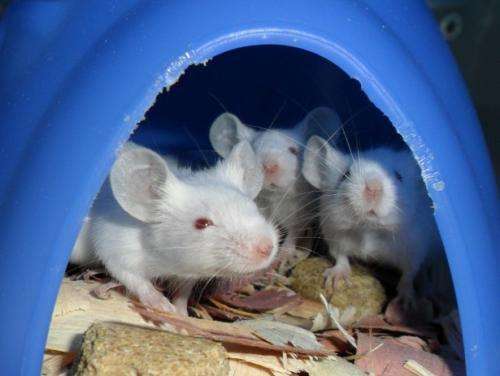 The researchers also found evidence that the brain growth triggered by the immune reaction was even greater in mice with a specific genetic mutation—a lack of one copy of a tumor suppressor gene called phosphatase and tensin homolog, or PTEN. The PTEN protein normally helps prevent cells from growing and dividing too rapidly. In humans, having an abnormal version of the PTEN gene leads to very large head size or macrocephaly, a condition that also is associated with a high risk for autism. Kornblum added that the findings that neural stem cell hyper-proliferation can contribute to autism-associated features may be somewhat surprising. "Autism neuropathology is primarily thought of as a dysregulation of neuronal connectivity, although the molecular and cellular means by which this occurs is not known," he said. "Therefore, our hypothesis—that one potential means by which autism may develop is through an overproduction of cells in the brain, which then results in altered connectivity—is a new way of thinking about autism etiology."